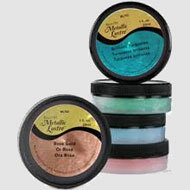 All crackle products allow for full control of crackle results based on the thickness of the application and the application technique. 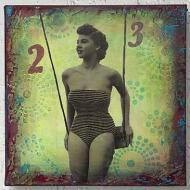 They dry to a permanent finish that can be painted, antiqued, or glazed over. They are water-based and non-toxic. Fast-drying Crackle Paint crackles as it dries to create an eggshell pattern in just one step. It should be used over a sealed surface for best results. Available in white. As the paint dries, it will begin to crack, showing the base color underneath. 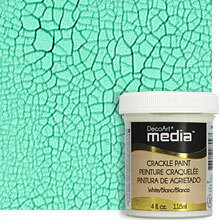 White Crackle Paint can be tinted with up to 20% Fluid Acrylics. Clear Crackle Glaze is a fast-drying, acid-free topcoat that will crackle as it dries to create an eggshell pattern in one step. 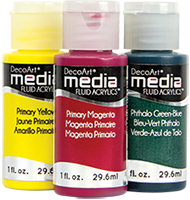 Its clear finish allows details and colors to show through and it is self-leveling. 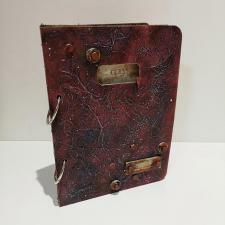 Once dry, the cracks can be antiqued with Media Antiquing Creams. 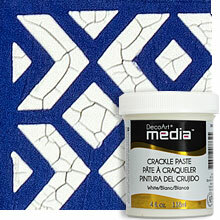 Dimensional Crackle Paste is a white paste that creates an eggshell cracking pattern as it air dries. It can be used alone or as a stencil paste. It can also be used build texture, and will give bigger cracks with thicker application. 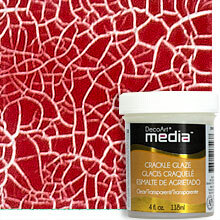 Media Crackle Paste can be tinted with up to 20% Media Fluid Acrylics. 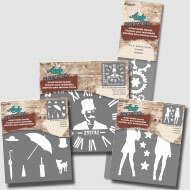 Each Media crackle product serves a different function when you are creating. Consult our chart to help determine the right product for the effect you are trying to achieve.